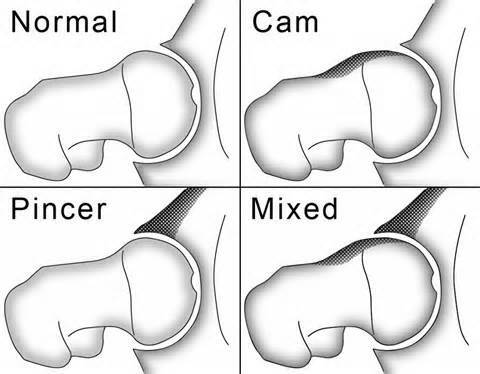 Femoroacetabular impingement is a relatively new diagnosis, where by there is a mismatch between the shape of the head of the femur and the acetabulum. Current evidence suggest that subtle shape abnormalities around the hip may be a significant contributing factor in the development of arthritis in young patients. The abnormal shape results in abnormal contact between the femoral head/neck and the acetabular margin leading to tearing of the labrum of injury to underlying cartilage. This usually causes pain in the hip, in a typical pattern, and pain on the anterior aspect of the hip. There are two distinct patters of FAI (Femoroacetabular Impingement) which describes patterns of Cam Lesions and Pincer Lesions. 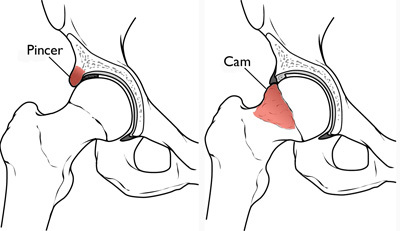 A Cam lesion occurs when an abnormally shaped femoral head is jammed into the acetabulum during normal movement of the hip, especially in flexion. This causes damage to both the femoral neck and the acetabular rim. Labral tears and chondral (cartilage) injury usually occurs with repeated injury. A Pincer lesion is the result of abnormal contact between the acetabular rim and the femoral neck. The femoral head may be normal in this situation, and the situation only arises due to the over coverage of the femoral head by the abnormal acetabulum. The first injury in this situation is the labrum. How does FAI result in osteoarthritis of the hip? With the continual delamination/injury to the surrounding cartilage, the hip joint starts to degenerate. Once cartilage is lost, and bone touching bone occurs, there is little that can be done. During the early phases of FAI, reshaping the head/neck or repairing the ligament can slow down the continual injury to the cartilage. This can be performed via arthroscopic (keyhole) or open means. The options for open surgery include a minimally invasive anterior approach similar to the method used by Dr Chien-Wen Liew in performing total hip replacement. The other option is called a surgical hip dislocation. There are benefits of each approach. With a hip arthroscopy, the patient is placed on traction, and keyhole surgery is performed under the guide of X-rays to ensure that the arthroscopy instruments are placed accurately. The risks of hip arthroscopy include damage to the nerve that runs in the groin due to traction, as well as instability of the hip due to excessive removal of the anterior capsule. There is also a risk of avascular necrosis (bone death) during this procedure due to the long period traction as well as damage to one of the nerves (Pudendal nerve) where the traction post is situated. With a surgical hip dislocation, the patient is placed in the side on position (lateral decubitus) and the hip approached by osteotomising (cutting the bone) and dislocating the hip. This allows full view of the femoral head. Lesions of the femoral head can be addressed all the way around the head, and the acetabulum. There is a risk of avascular necrosis also with this approach and with non union (failure to heal) of the osteotomised bone. It is the most complete approach, with all lesions being able to be addressed. In most cases, a muscle sparing, direct anterior approach similar to the one utilised by Dr Liew for his total hip replacements can be used to address 90% of cases. As most significant impingement occurs anteriorly, this allows access to the anterior labrum and anterior cam lesion. As it is muscle sparing, patients are often rehabilitate quickly. The risk of avascular necrosis is minimised as the head is not dislocated. There is no osteotomy so there is no risk of non union. The main disadvantage of the direct anterior approach is in the 10% of cases where the defect is on the back side of the femoral head (posterior cam lesion). This is evident on pre-operative MRI scans which will be used to make a decision regarding whether the direct anterior approach is appropriate or not. Post operatively, patients who undergo labral fixation will be partial weight bearing with crutches, and allowed to put up to 20kg through the repaired leg. The labrum takes 3 months to heal. No sport is allowed until 6-12 months post op. The chances of arthritis in the hip is still increased as compared to the unaffected population, however post fixation, and removal of the cam lesion, the patient should not deteriorate as quickly, and may be of an appropriate age when it comes time for a total hip replacement. If the debridement is performed via the direct anterior approach, the same approach can be used for the total hip replacement in the future with no issues.